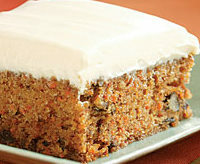 You will love this Carrot cake recipe for two reasons. 1) It is very healthy - made from whole meal flour, carrots and bananas. 2) Fairly easy to make and an amazing taste. What more can you ask for...right?? Put all the ingredients in a mixing bowl and combine well until evenly blended. You can use a stand mixer, a food processor, a hand held mixer or a even a wooden spoon for this. Transfer the mixture into the lined tin and bake in a preheated oven at 180°C for 40-50 minutes, or until the cake is well risen and firm to touch. When it is done it will shrink from the sides of the tin. After about 40 minutes, insert a knife or skewer at the center of the cake. If it comes out clean, your cake is done. If not the put it back in the oven for another 5 minutes. Once done, keep the tin outside for 5 minutes, then invert it on a cooling rack. Let the cake cool completely. Prepare the topping by mixing all ingredients well and spread this on top of the cake. Put the cake in the refrigerator until ready to be served. Enjoy the healthy carrot dessert! !